7.30: Depart from Hanoi. The journey from Hanoi to Mai Chau takes about three hours and a half including some short breaks, photo stops. You will arrive in Mai Chau valley around noon, in time for lunch. In the afternoon, enjoy a short bicycle ride to discover the interesting surroundings and ethnic minority tribes of Lac and Van Village. You cycle for about two hours on flat roads, off-road biking trail. In the evening, complement your experience by sampling delicacies from the local region during dinner time and enjoy the performance by local troupe of ethnic minority Muong and Thai people. It is so relaxing to watch the exotic dances featuring the flower, land-scape and daily agriculture cultivating activities and sweet dating songs in the fresh mountain air. Overnight at local home (homestay). 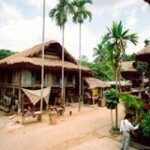 We arrive at Poong Coong village in the late afternoon. Overnight in home stay. Please be advised that the local home stay is not the hotel and the home stay is exactly in the condition how the local people live. The home stay has a squad toilet and no shower. It is very basic. We always try to choose the clean enough home stay to offer our clients. But please do not expect too much at a local home stay. This is a part of experience when you take this trip. The White Thai home stay is very clean and in a better condition. We stay in the house on stilts. The family provides us clean mats (quite hard), mosquito nets, blankets, pillow.